1. Pour the milk into a small, non-stick saucepan and warm gently. Add the eggs and parmigiano reggiano and cook for 3-5 minutes, stirring continually until set and creamy. 2. 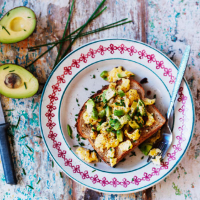 Spoon the eggs on top of the toast, scatter over the avocado, sprinkle with chives and serve. For French-style toast, instead of scrambling the eggs, beat them with the milk and lay the bread in the mixture, turning once or twice until it has soaked in. Spritz a large non-stick frying pan with olive oil spray and cook the bread for 3-4 minutes on each side until golden brown. Top with the parmigiano reggiano, avocado and chives to serve.